I become embarrassed and ashamed every time Comey opens his mouth! In an interview with The Irish Times on Friday, former FBI Director James Comey has disgraced himself and betrayed his country. He showed huge disrespect towards our country and said he wanted to avoid calling himself an American. Today the Hill broke another story that will put to shame our former FBI chief! The Hill‘s John Solomon broke the news on Monday night. One of the more devastating intelligence leaks in American history — the unmasking of the CIA’s arsenal of cyber warfare weapons last year — has an untold prelude worthy of a spy novel. Some of the characters are household names, thanks to the Russia scandal: James Comey, fired FBI director. Sen. Mark Warner (D-Va.), vice chairman of the Senate Intelligence Committee. Department of Justice (DOJ) official Bruce Ohr. Julian Assange, grand master of WikiLeaks. And American attorney Adam Waldman, who has a Forrest Gump-like penchant for showing up in major cases of intrigue. 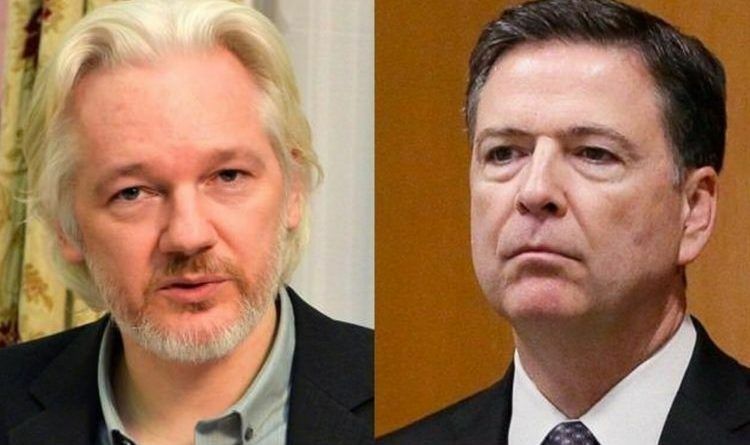 Each played a role in the early days of the Trump administration to try to get Assange to agree to “risk mitigation” — essentially, limiting some classified CIA information he might release in the future. The effort resulted in the drafting of a limited immunity deal that might have temporarily freed the WikiLeaks founder from a London embassy where he has been exiled for years, according to interviews and a trove of internal DOJ documents turned over to Senate investigators. Read the draft immunity deal proffer that the Justice Department was considering for Assange here. He does have reason to be ashamed, but he’s so confused about what it means to be of good character, that he doesn’t understand his shame comes from within himself. What do you think? Scroll down to leave a comment below! Facebook has greatly reduced the distribution of our stories in our readers’ newsfeeds and is instead promoting mainstream media sources. When you share with your friends, however, you greatly help distribute our content. Please take a moment and consider sharing this article with your friends and family.